Scotland has today introduced a minimum price for alcohol - sparking warnings that Scots will flock south of the border on 'booze cruises' to save money. Supermarkets just over the border in Berwick-upon-Tweed have stocked up on extra alcohol in anticipation of a surge in demand. The price of spirits, beer and cider have been hiked to 50p per unit in a bid to tackle the health crisis afflicting the country. Scotland is the first country in the world to adopt the drastic measure, which will push up the price of the cheapest 2 litre bottle of cider from £1.99 to £5. 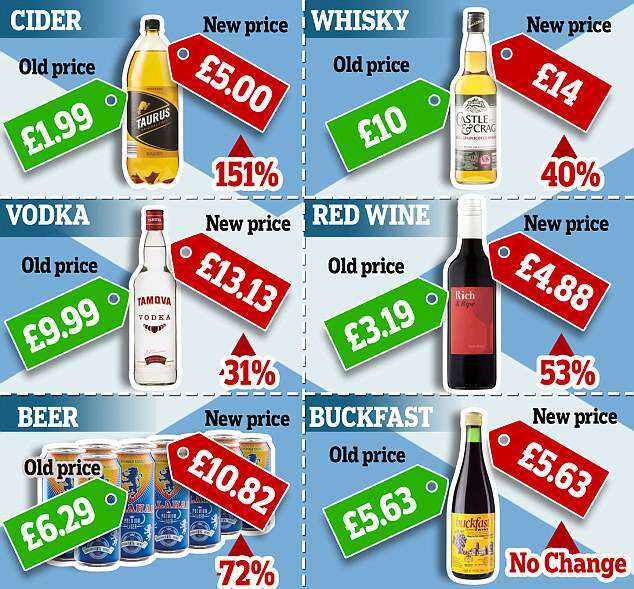 But the cost of Buckfast, a fruity fortified wine which became synonymous with loutish behaviour in Scotland, will stay the same at £5.63, as this is already more expensive than the minimum unit price. England is not increasing its alcohol prices - and big supermarkets have increased their booze orders in anticipation of a surge in demand from Scots crossing the border to take advantage of the lower prices. Mr Atkinson said he is braced for a big surge in demand when the hot weather kicks in and drinkers wants to stock up on beer for barbecues. 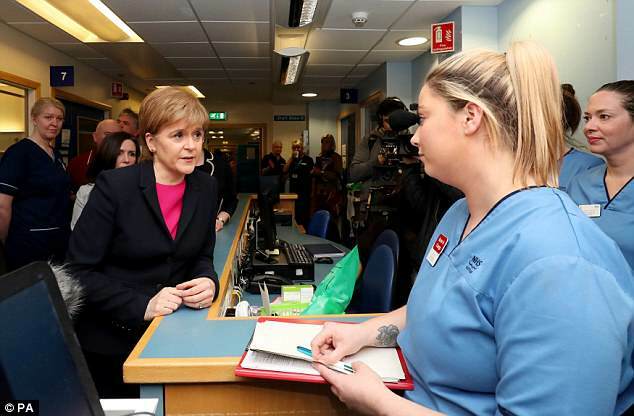 He said: 'A lot of Scots came in at the weekend and asked us if our prices were going to go up too - just to check. 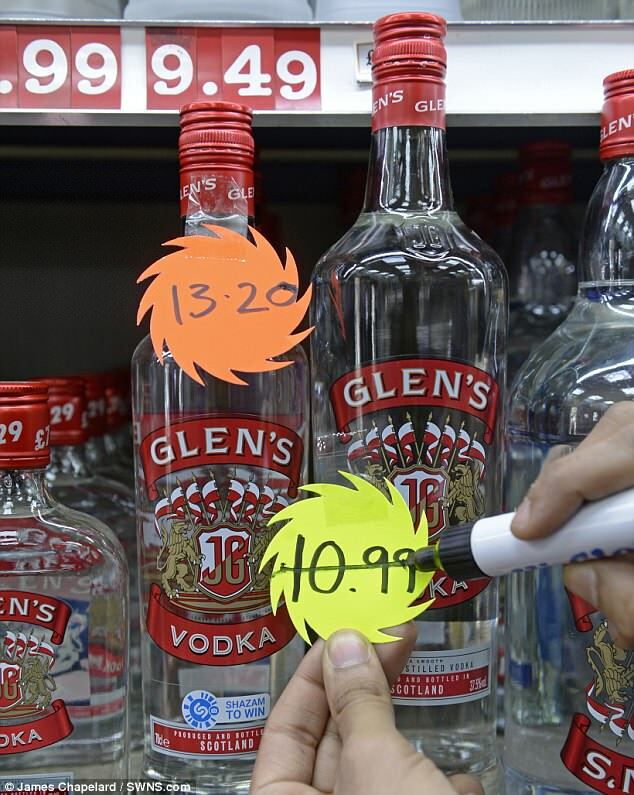 What has happened to the price of alcohol in Scotland? Scotland has increased the minimum price of alcohol to 50p per unit - making it the most expensive country in the UK to buy booze in. 'It is too early to say yet what effect it will have - but we think it will have some effect. We think it will have a big effect at Christmas and on hot days. It is being monitored by head office. He said there has been some talk that Berwick-upon-Tweed could be the new Calais - the traditional booze cruise destination in France but 'we will have to wait and see'. Meanwhile critics have also warned that bootleggers could try to take advantage of the law by selling their illegal - and potentially dangerous - alcohol. Anne-Marie Trevelyan, the Conservative MP for Berwick-upon-Tweed, an English town near the Sottish border, said the country may see a new booze cruise route. 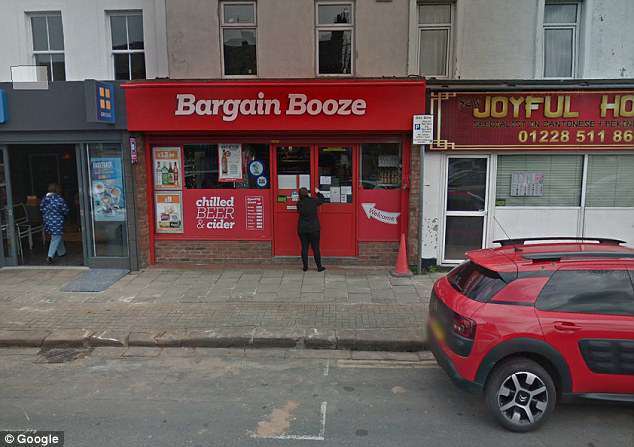 She told Mail Online: 'It may be that this new Scottish pricing policy encourages entrepreneurial activity in Berwick to offer alcohol with a price differential from across the Border. 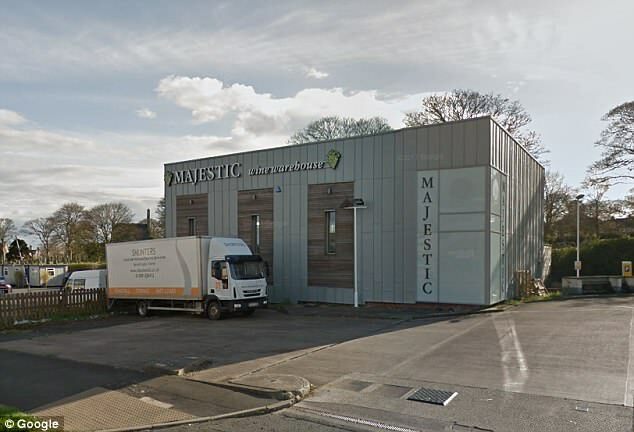 The House of Malt in Carlisle is hoping to cash in on the change by expanding its lower range whiskys and laying on offers in its shops, which are near the Scottish border. Store manager Mike Little told The Telegraph he hopes the minimum pricing rule will boost his business. He said: 'I hope so - a lot of the products we have are top end so the alcohol minimum prices won't affect those. The scale of middle class drinking was laid bare today with figures showing doctors, lawyers and teachers are more likely to indulge than manual workers. Nearly 70 per cent of people with managerial and professional jobs had consumed alcohol over the past week, according to a major survey. By contrast the figure for routine and manual workers was just 51 per cent. The highest earners in the UK are also the most likely to drink, the findings of the ONS Opinions And Lifestyle Survey show. Of those earning £40,000 and above, some 79 per cent said they had drunk alcohol in the previous week, compared with 57 per cent of those aged 16 and over across the UK. The figures emerged as Scotland became the first country in the world to implement a minimum unit price for alcohol. Mike Beale, Chief Executive Wine and Spirit Trade Association (WSTA), said: 'The Scottish Government's policy will increase the price of around half of the alcohol on supermarket shelves and will impact most drinkers, particularly those on lowest incomes. 'The WSTA's long held view is that MUP (minimum pricing unit) is likely to be ineffective in changing the behavior of problem drinkers. 'There are also serious questions about the potential impact on cross border trade and illicit alcohol. Christopher Snowdon, the director of lifestyle economics at the Institute of Economic Affairs, told The Daily Telegraph: 'I would say that Scots will be hopping across the border to buy alcohol that is, in some cases, less than half price. 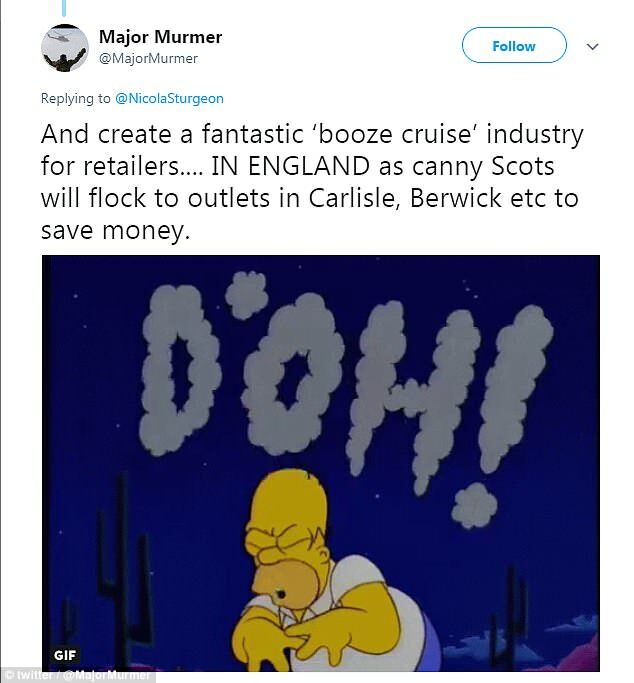 'As with booze cruises to France, some will be doing it legally for their own consumption and others will be doing it to sell illegally in Scotland. 'A large and legal online business is likely to emerge to satisfy demand and there is nothing the SNP can do about it. lly and they will have to live with the consequences. 'For those who live a long way from the English border, we may see a growth in home brewing and home distilling. 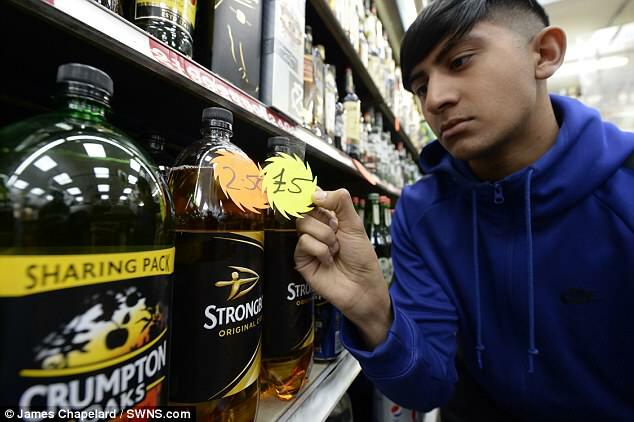 Yesterday, many shops reported selling out of heavily discounted ciders and cheap own-label spirits as they ditched surplus stock before the higher prices came into force. How is the minimum alcohol charge worked out? The minimum alcohol charge has been set at 50p a unit. This means that a standard bottle of win, which has 10 units, will cost £5. The cheapest bottles of alcohol - like cider or non-branded vodka - have seen some of the highest increases in their prices. But other more expensive bottles of alcohol are unlikely yo see any change in price, as they are already priced above to 50p per unit. Research by the University of Sheffield, published in April 2016, estimated that the proposed minimum price of 50p per unit would result in 120 fewer alcohol-related deaths every year. And hospital admissions would fall by 2,000 per year by year twenty of the policy. At Morrisons in Giffnock, Renfrewshire, gin and Bacardi were on sale for £10 and Baileys for £8. Lorraine Matthews, 54, from Mansewood, Glasgow, snapped up a bottle of Glenallachie malt whisky for only £12. She said: 'I couldn't believe what I was seeing in the store. Scotland has among the worst health outcomes of all of the UK. Ministers say they have imposed the measure to tackle poor health and alcoholism. Scotland's First Minister Nicola Sturgeon praised her country for being 'bold enough and brave enough' to take the step. She said: 'All of the evidence says that minimum unit pricing will reduce deaths from alcohol-related illnesses, reduce hospital admissions and generally reduce the damage that alcohol misuse does to our society. Britain's Supreme Court finally rejected the distillers' challenge last year.